A girl is discovered hiding in a secret room in the aftermath of a terrible crime. Half-starved and filthy, she won’t tell anyone her name, or her age, or where she came from. Maybe she is twelve, maybe fifteen. She doesn’t appear in any missing persons file, and her DNA can’t be matched to an identity. Six years later, still unidentified, she is living in a secure children’s home with a new name, Evie Cormac. When she initiates a court case demanding the right to be released as an adult, forensic psychologist Cyrus Haven must determine if Evie is ready to go free. But she is unlike anyone he’s ever met—fascinating and dangerous in equal measure. Evie knows when someone is lying, and no one around her is telling the truth. Meanwhile, Cyrus is called in to investigate the shocking murder of a high school figure-skating champion, Jodie Sheehan, who dies on a lonely footpath close to her home. Pretty and popular, Jodie is portrayed by everyone as the ultimate girl-next-door, but as Cyrus peels back the layers, a secret life emerges—one that Evie Cormac, the girl with no past, knows something about. A man haunted by his own tragic history, Cyrus is caught between the two cases—one girl who needs saving and another who needs justice. What price will he pay for the truth? 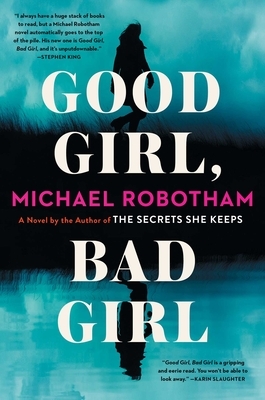 Fiendishly clever, swiftly paced, and emotionally explosive, Good Girl, Bad Girl is the perfect thrilling summer read from internationally bestselling author Michael Robotham. Michael Robotham is a former investigative journalist whose psychological thrillers have been translated into twenty-three languages. In 2015 he won the prestigious UK Gold Dagger for his novel Life or Death, which was also shortlisted for the 2016 Edgar Allan Poe Award for best novel. Michael has twice won a Ned Kelly Award for Australia's best crime novel for Lost in 2015 and Shatter in 2008. He has also twice been shortlisted for the CWA UK Steel Dagger in 2007 for The Night Ferry and 2008 with Shatter. He lives in Sydney with his wife and three daughters.